I married an Italian man, so do you know what that means? I make pasta. Rico, I mean Richard, LOVES his pasta. He’s taught me quite a few tips over the years regarding pasta, and as we’ve gotten older, the Italian tables have turned. Now I teach him how to “make a the pasta” and he seems to really enjoy it. So, this year for Valentine’s Day I’m taking the reigns again, and we are staying home. 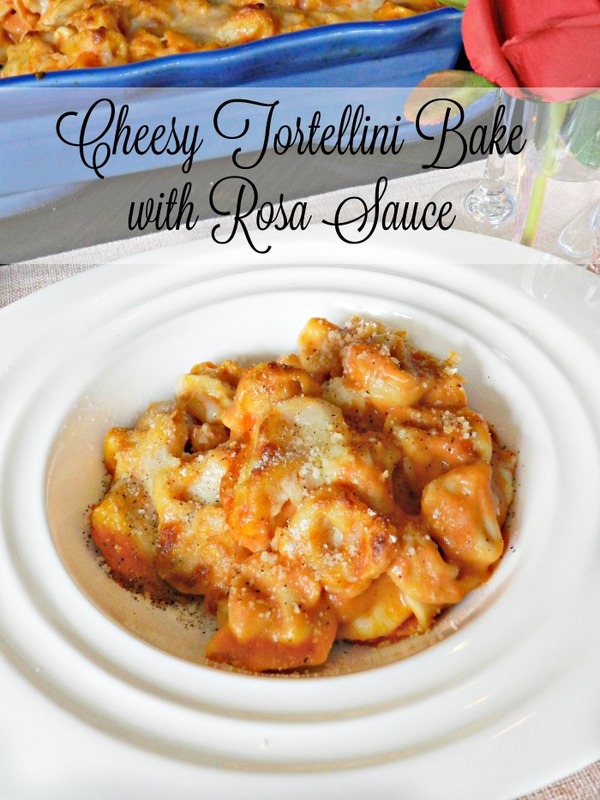 There’s absolutely no reason in the Tuscan world for us to venture out in the -0 cold temperatures when I now have this simple “30 Minute Cheesy Tortellini Bake” recipe that I can whip up…in 30 minutes 😉 . That includes cooking time folks. Heck, it would take us that long to figure out what restaurant to go to. Then, imagine the long lines, and wait time. No way, man. Why waste all of that time bickering driving when we can enjoy our warm toasty fire at home, and even utilize my “Valentine’s Day Table for Two” that I designed last week. Did you happen to see that yet? 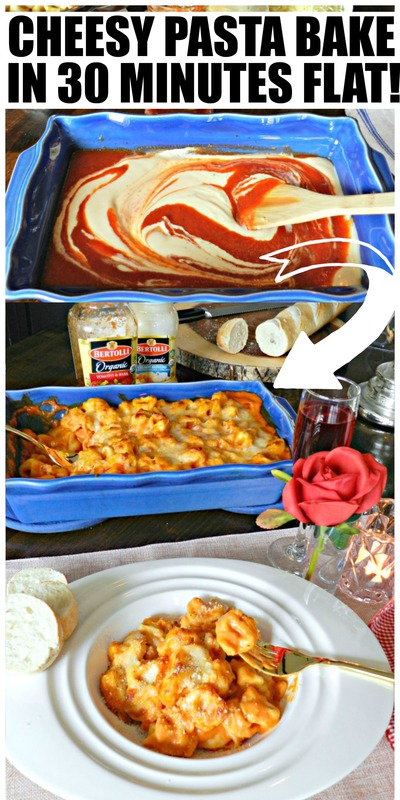 It’s so cute for a nice romantic dinner, and this “30 Minute Cheesy Tortellini Bake” will set the mood for a wonderful evening of relaxation. Which is very much needed, by the way. Uh oh, you’re beginning to drool a little bit at the sight of my new favorite pasta recipe aren’t you? Don’t worry about it. I totally understand and don’t blame you one bit. 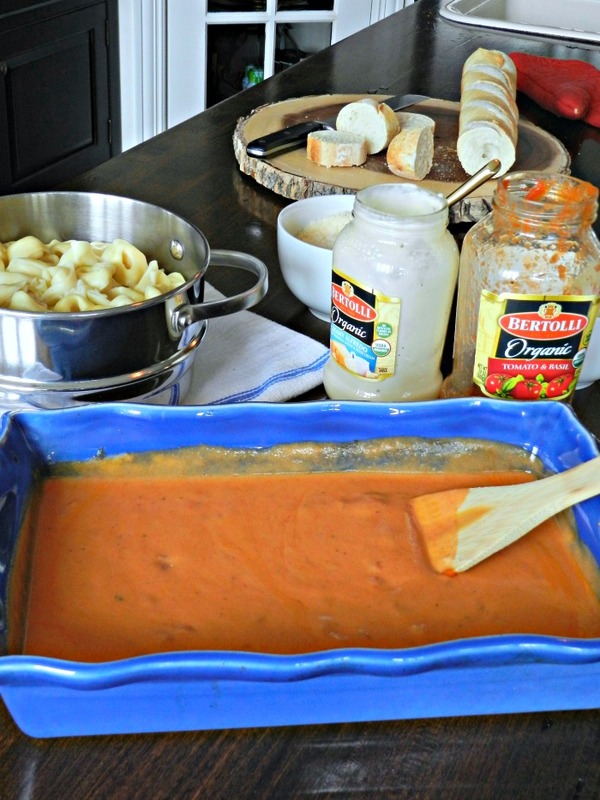 When I tried this simple Rosa sauce idea I was absolutely shocked at how delicious it is. It almost tastes as if I cooked the sauce for 15 hours. Well guys, I would never lie to you. I didn’t have to cook the sauce at all 😯 . 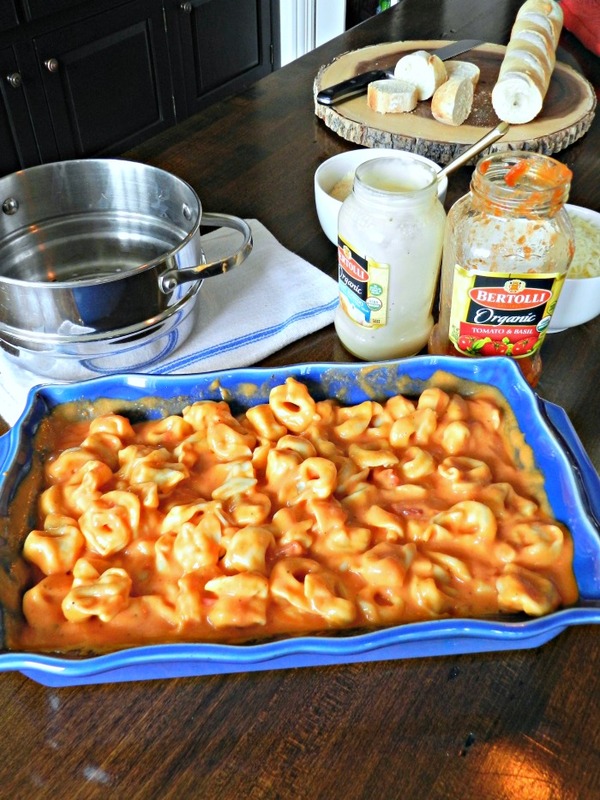 When Bertolli® invited me to try mixing their two Bertolli® Organic Sauces to create one Rosa sauce, I couldn’t wait to try it with cheese tortellini I already had in the freezer. What I didn’t realize was that combining Bertolli® Organic Traditional Tomato & Basil Sauce and Bertolli® Organic Creamy Alfredo Sauce was going to develop a rich savory Rosa sauce that would knock my red fuzzy slippers off. All in 30 minutes. 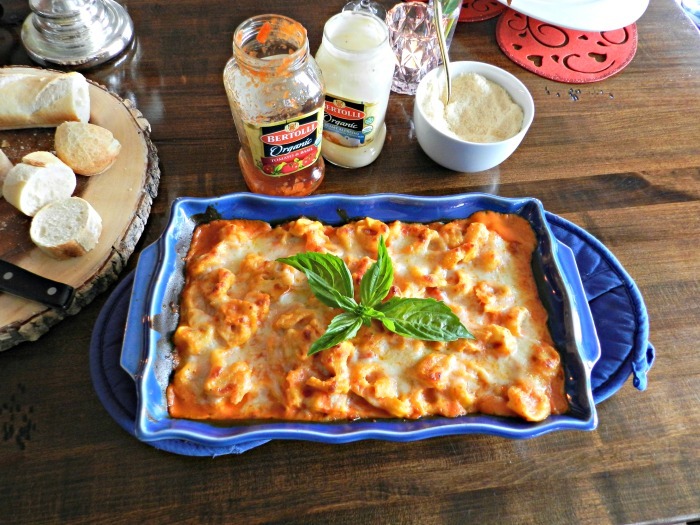 While researching, I learned that Bertolli sauce’s are not only organic and made with non-GMO ingredients (meaning non-genetically modified organisms which is better for us), the sauces originated in Tuscany, and are prepared simply and cooked lightly to lock in layers of delicious tomato flavor. YUM. I need all the tomato flavor I can get. 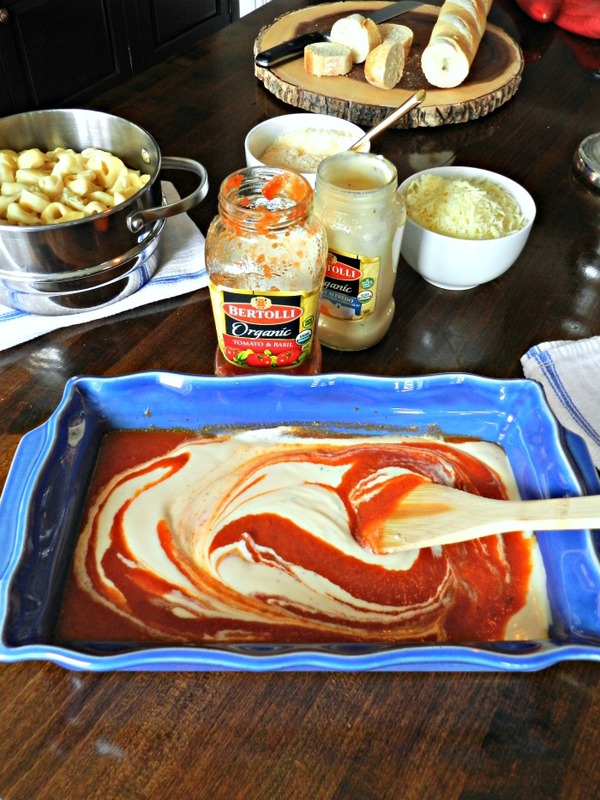 Even when I poured the sauces into the baking dish I was amazed at how beautifully they blended. Then after a few seconds the rich Rosa sauce was born, and my tortellini where about to go swimming. I tried the warm tortellini after I added them to the Rosa sauce and honestly I could have stopped there, sat down, and ate it all. The Rosa sauce on the tortellini was that good. It also would have been dinner in just five minutes since basic cheese tortellini only take about three minutes. I thought of the kids when I was at this stage, and wished I knew this idea years ago when they were little. Cook tortellini according to package instructions, drain, and set aside (mine took 3 minutes). 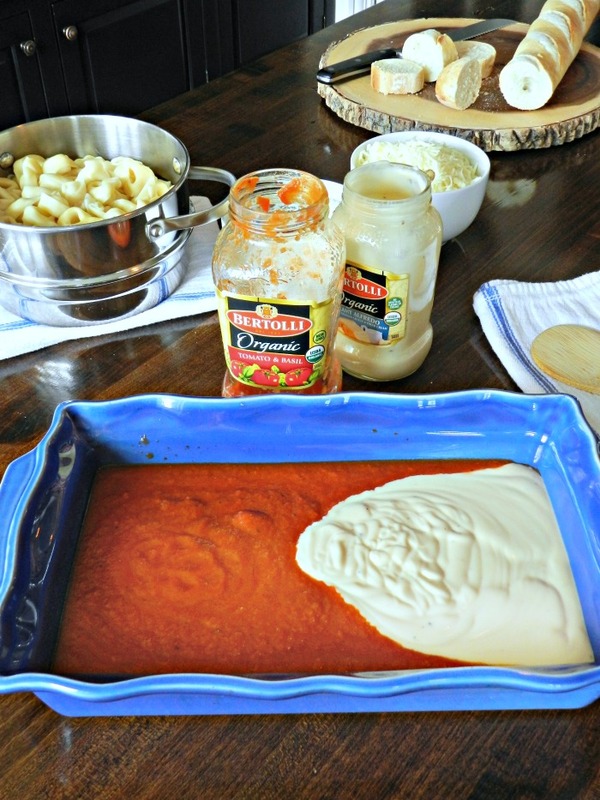 Add the full jar of Bertolli® Organic Traditional Tomato & Basil Sauce and the full jar of Bertolli® Organic Creamy Alfredo Sauce to an ungreased (approximately 13x9 inch) baking dish. Mix both sauces in baking dish until combined thoroughly. Rosa sauce will be pink. Add cooked/drained tortellini and combine the sauce and pasta thoroughly. Sprinkle the saucy pasta with the mozzarella and parmesan cheese. Bake for 20 minutes until cheese is bubbly and browned. Serve with Italian crusty bread. Is it a smooth tomatoe sauce? Not a fan of chunky. 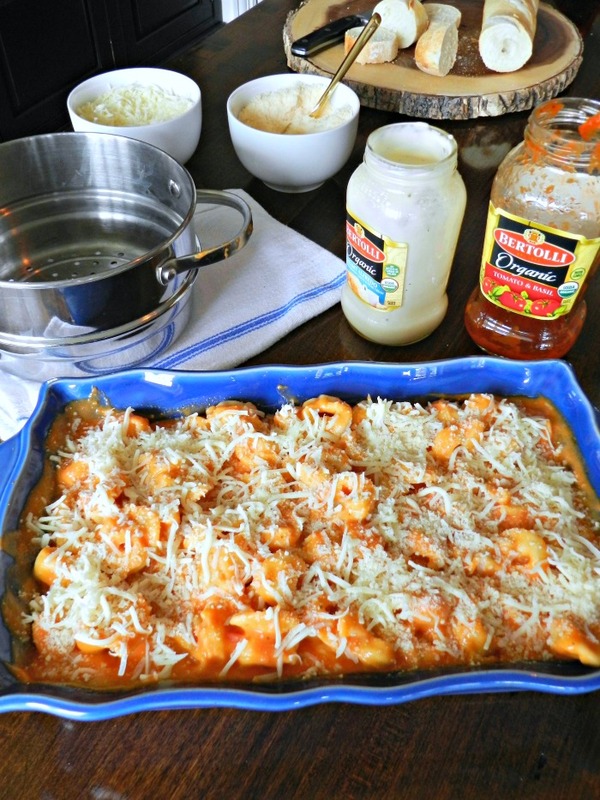 Hi Julie, Oh my gosh, I’ve got to try your tortellini bake recipe, it looks so delish! Mi amour’s belly won’t let him indulge in straight tomato sauce anymore. But truth be told, I’ve been mixing Bertolli Vodka Sauce with their Alfredo Sauce so that he can enjoy pasta once in a while. I think it’s time for trade the angel hair for some tortellini! Kaycee the frozen tortellini is so yummy!! I ate too much that day!! Great post Julie……You do a great presentation of any recipe. I must try this one also. Lots of comfort food going on around here, Bette! My hubby is Italian and lives anything pasta related. Not sure what we’re doing Valentines Day but I think he will come home to a surprise. This recipe is so easy and looks sooo delicious I can’t wait to try it. Thanks! Thank you, Barb! It really is a keeper!! Julie, You have put this poor mind to rest! I’ve been wanting to prepare something to surprise the man in my life this Valentines (45 yrs) He loves Alfredo sauce and I the tomato & basil, what a perfect blending of marrying the two! This definitely is on our table February 14th! Now that made my day! The 2 sauces symbolize your marriage! This was amazing! Please make more! The two together was delish! Glad you liked it Rico!! That looks sooooooo good!! 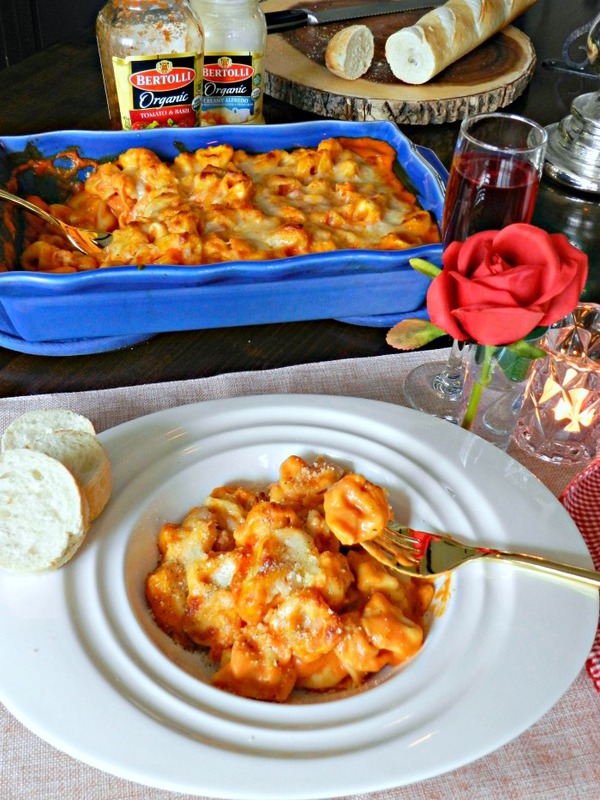 Nothing like an easy pasta dish to make for a cold winters night or a special Valentine….? Great idea to mix the two sauces together! I am with you sister! I had the pleasure of trying it at your hubby’s work. It wa yummy! Rick kept texting me about how fast it was going! Glad you enjoyed it! Definitely trying this one out soon in the Ninja Foodi! I would have never thought of combining the two sauces. Looks amazing Julie! That was a terrific dish, never thought about combining the two sauces, delicious. My hubby is 2nd generation Italian and loves anything tomatoey with pasta. 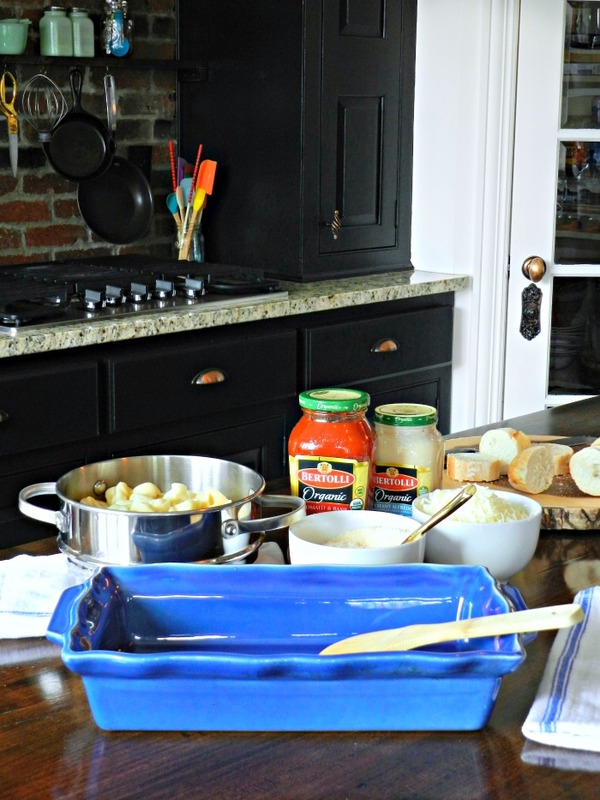 Also, love the blue casserole dish, where did you find that?